In the wonderful "Garden of France" in the Loire Valley, Manoir de Gourin provides an enchanting, rural retreat, offering an escape into the world of loire wines, food, relaxation and pleasure. 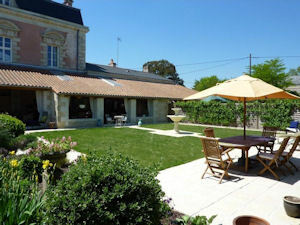 The manor house lies in the heart of the Saumur and Anjou vineyards of the Loire Valley. Manoir de Gourin sits in large and mature grounds in the commune of St Macaire du Bois, 15 miles south of Saumur. 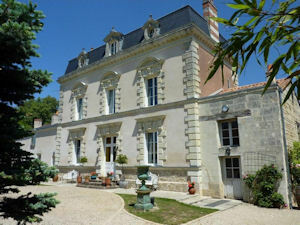 A former winemaker's residence and winery, the beautiful Manoir de Gourin has been sympathetically renovated by Simon and Karin Grainger to provide guests with all the comforts required for total relaxation and enjoyment during their stay. The old, winemaker's cellar or 'chai' has now become a lovely, light, roofed terrace. It extends along the rear of the house overlooking the garden and is one of the delightful locations for our wine presentations and wine tastings. 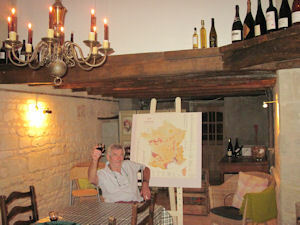 The former room where the grapes were pressed has been restored and is now used as a wine room. The chic wine room overlooks the swimming pool, providing another wonderful backdrop to Simon's presentations and wine tastings. We offer superior accommodation at the beautifully restored Manoir de Gourin where facilities include a heated swimming pool. The elegant 'salon' offers a comfortable and cosy place to relax whilst delving into our wine book library. Enjoy a coffee, a glass of wine or after dinner liqueur. The large dining room 'salle a manger' has been restored in baroque style and provides a cosy, intimate backdrop for guests to enjoy our gourmet wine-tasting dinners. 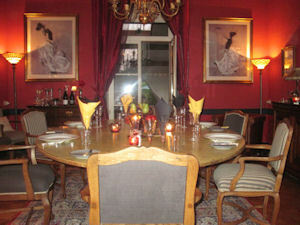 Please view our Manoir de Gourin picture gallery. We look forward to welcoming you to Manoir de Gourin, La Grande Maison.